The Azores are an autonomous region of Portugal, comprising nine volcanic islands in the North Atlantic. They are commonly grouped together into three regions. The eastern group consists of Santa Maria and Sao Miguel, the central group: Terceira, Graciosa, Sao Jorge, Pico and Faial and the western group: Corvo and Flores. The islands’ scenery is characterised by sapphire blue lakes, vast fields and charming chapels. You could spend an afternoon spotting whales, cycling across the dramatic landscape or relaxing in natural hot springs; the Azores have it all. The largest island, Sao Miguel, offers everything that makes the archipelago so appealing. You can wander through cobbled streets, try some fresh octopus stew at a local restaurant, or simply gaze across the magnificent crater lakes. In the island’s capital, Ponta Delgada, there are a number of attractive old buildings dotted across town, most notably the Machado Natural History Museum. A great time to visit Ponta Delgada is during the ‘Festival of the Lord Holy Christ of the Miracles’ on the fifth Sunday after Easter. The streets are decorated with flowers whilst a procession carries an image of Christ through the city. Pico is sparsely populated but ideal for exploring. Be sure to visit ‘Gruta das Torres’, the longest lava tube in Europe. Or you can hike up the 2,351m dormant volcano, Mount Pico. 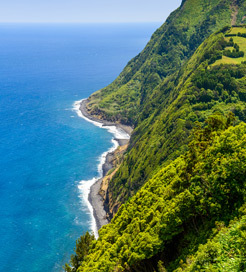 All nine of the Azores Islands are well connected by ferry. However, the archipelago is sparsely spread across the North Atlantic and so the average journey time between each island varies greatly. These routes are operated by Atlanticoline, who provides a few sailings every week.